Lyme disease can manifest in a seemingly endless number of ways. While the spectrum of symptoms is similar for most sufferers, the worst of the bunch varies from person to person. And for those who have a predominance of neurological symptoms, the disease can feel especially debilitating and difficult to overcome. That’s in large part because neurological Lyme — also referred to as Lyme neuroborreliosis (LNB) — is often confused with other serious neurological conditions such as multiple sclerosis and Parkinson’s Disease, which can be scary and overwhelming. And because most doctors lack an understanding of Lyme disease in general, and especially of Lyme associated with a predominance of neurological symptoms, LNB often goes unrecognized. So how to know if the symptoms you’re experiencing do signify LNB, and where do you go from there to find relief? Keep reading for information that could provide the turning point in your recovery. Lyme neuroborreliosis is thought to occur in about 15% of Lyme disease cases — but a definite percentage is impossible to pin down. Everyone with Lyme disease experiences some neurological symptoms, but a specific composit of symptoms that constitute neurological Lyme is not well defined. Making matters worse, the Centers for Disease Control (CDC), does not recognize LNB as a separate entity, and it doesn’t acknowledge the existence of a chronic form of Lyme disease. The most common initial symptom is neurogenic (nerve) pain that starts in the back and radiates down the legs. With that comes weakness, numbness, and tingling in the lower extremities. Another common presenting symptom of LNB is facial nerve palsy (Bell’s palsy), which is characterized by temporary paralysis on one side of the face. Some people also experience sound sensitivity and discomfort in the ear on the paralyzed side, and if you’re unable to close that eye, dry eye can occur. Most people recover fully from Bell’s palsy, with improvement in the first few weeks and continuing for three to six months, but a minority of people have symptoms for life. The transition from acute to chronic neurological symptoms is not well defined, and it varies widely from person to person. Many people don’t remember a tick bite and experience minimal acute symptoms. The range of symptoms includes both motor and sensory nerve deficits. On the list: headache, memory loss, brain fog, cognitive impairment, learning disability, anxiety, depression, limb pain, muscle weakness, and paresthesias (sensory loss and odd sensations on the skin). Symptoms of LNB are thought to occur from infiltration of white blood cells — immune cells like lymphocytes and plasmocytes — into the white matter of the brain and the spinal cord, otherwise known as the central nervous system (CNS). This is associated with an increase in inflammatory immune messengers, called cytokines, in cerebrospinal fluid. Loss of sensory and motor nerve function is thought to be related to demyelination of nerve fibers. Found in the brain and peripheral nervous system, nerve fibers are coated with a fatty substance called myelin. Myelin acts much like the plastic coating on a copper wire: it wraps around nerve fibers, thus preventing the nerve fibers from touching each other and “shorting out” when an electrical current passes through. If demyelination is severe enough, it can result in abnormal nerve conduction tests, similar to multiple sclerosis. Treatment for neurological Lyme is highly controversial. The CDC recommends antibiotic therapy using doxycycline, cefuroxime, or amoxicillin, limited to 10-21 days for formally diagnosed Lyme disease only. Remember, they don’t define LNB as separate from Lyme disease, and so specific treatment recommendations are not provided. Notably, the CDC website also cites numerous scientific articles showing that long-term antibiotic treatment for Lyme disease is not efficacious. Among physicians who do recognize and treat LNB, there is no absolute consensus on therapy. Some physicians recommend 1-3 months of combined intravenous antibiotic therapy, and some continue to treat patients as long as symptoms are present. Confusing matters more, some studies that suggest oral antibiotic therapy is as efficacious as intravenous antibiotics, but long term follow up for any therapy is limited. Central to the confusion is the fact that understanding of LNB and Lyme disease in general is clouded by reductionist science — studying one variable in a vacuum, while ignoring all other potential influencing variables. The variable in this case: the microbe Borrelia burgdorferi, the primary pathogen behind Lyme. Anyone struggling with Lyme knows that the disease isn’t caused by borrelia alone. Indeed, having coinfections with microbes other than borrelia is more common than not. The most common coinfections include mycoplasma, bartonella, chlamydia, babesia, anaplasma, ehrlichia, and rickettsia. And all of these pathogens have the potential to cause neuroinflammatory symptoms that are characteristic of LNB. Though all of these microbes can be transmitted by ticks, they can also be transmitted by other routes. For instance, bartonella is most commonly spread by scratches and bites from dogs and cats. Babesia can be transmitted by ticks and mosquitos. And mycoplasma and chlamydia are most commonly spread by respiratory or sexual route. They often don’t cause significant symptoms at initial infection. They infect white blood cells and quietly spread to all tissues throughout the body, including brain and nerve tissues. They are able to generate inflammation to break down tissues and gain access to nutrients. They are masters at manipulating the immune system. They occur in low concentrations in the body, allowing them to blend in with other microbes. The stealth microbes we know about may be just scratching the surface — science uncovers new ones on a regular basis. Ticks and other biting insects can spread an enormous variety of microbes beyond the classic coinfections. Microbes can also be spread by oral routes, inhalation, intimate contact with other people, breaks in skin, and blood transfusions or contact with contaminated blood. Some of these microbes are more concerning than others, but if your immune system functions are strong, you’ll never know they’re there. In other words, the chances that you’ve encountered and picked up a variety of stealth-type microbes at some point in your life are much higher than you might think. And you’ve likely carried them without even knowing it, because they can remain dormant in tissues for years without causing harm. This is true even with borrelia: People suffering from chronic Lyme disease typically don’t become chronically ill immediately after a tick bite. 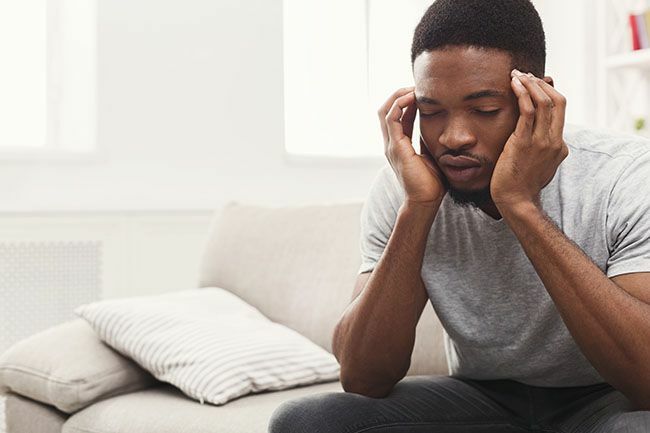 Onset of illness can happen months or even years later — it is typically surrounded by a perfect storm of stress factors that come together to disrupt immune system functions. I’ve often related it to a pot boiling over on the stove. If immune system functions are healthy, microbes can be present in tissues, but suppressed and not causing symptoms — the equivalent of a pot of water on the stove being kept at a low simmer. But if immune system functions become disrupted, the pot of water starts to boil. Immune disruption is most often caused by a combination of chronic stress factors such as poor diet, exposure to toxic substances like mold toxins, and emotional or physical stress. Sometimes, the tipping point is the infection caused by microbes that are acquired from a tick bite. But most often, the microbes are already present in the host, and they only become ill when other stress factors accumulate in their lives. 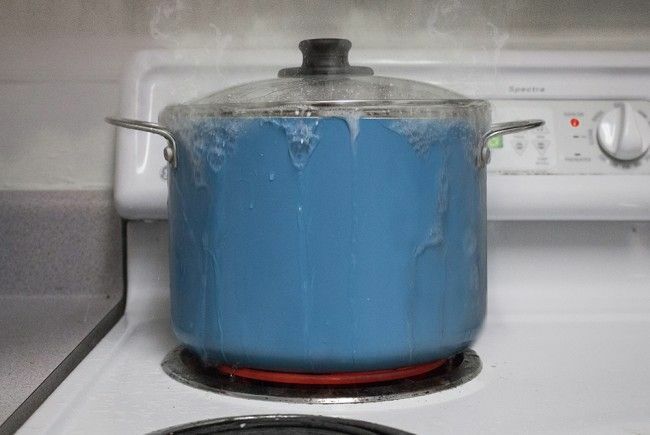 No matter what the initiating cause, however, when the pot reaches a full boil, it’s no longer an infection with one microbe or even a few microbes. Instead, it’s a disruption of the entire microbiome. Once microbes start becoming active, inflammation increases and immune functions are further compromised, establishing what I call Chronic Immune Dysfunction (CID). In its weakened state, the immune system allows reactivation of viruses such as Epstein Barr virus (EBV), Cytomegalovirus (CMV), and other similar viruses — all of which most people harbor in their tissues. These viruses are commonly associated with neuroinflammation, and they tend to complicate the picture of LNB. Chronic Immune Dysfunction also allows opportunistic pathogens to flourish in the gut and elsewhere in the body. The inflammation they generate compromises the gut barrier, allowing microbes along with foreign proteins from food to pass into the bloodstream. This heightens systemic inflammation and can compromise the blood brain barrier, allowing microbes to pass into the brain and nervous system. 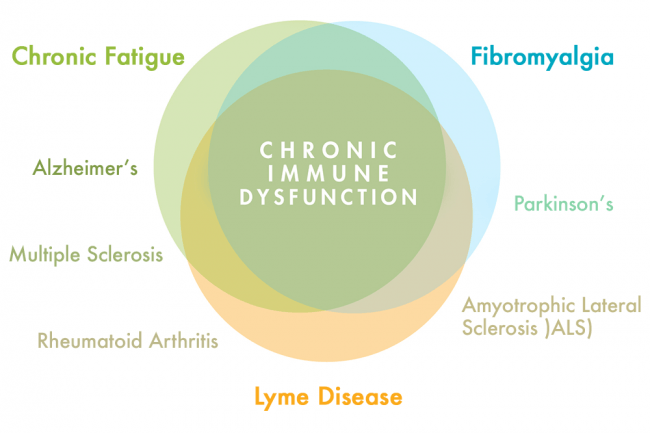 Chronic Lyme disease shares many symptoms with other chronic illnesses. This is especially true of Lyme neuroborreliosis and chronic neuroinflammatory illnesses such as multiple sclerosis, Alzheimer’s disease, amyotrophic lateral sclerosis (ALS), Parkinson’s disease, and traumatic brain injury. Not surprisingly, new sophisticated methods of microbial detection are showing potential links between these neuroinflammatory illnesses and many of the microbes associated with chronic Lyme disease. For instance, both mycoplasma and chlamydia have been closely linked to multiple sclerosis. Mycoplasma, borrelia, and chlamydia have been associated with demyelination. Parkinson’s and ALS have been linked to borrelia and other microbes commonly associated with Lyme disease. Borrelia and other stealth pathogens have been found in the brains of patients who died of Alzheimer’s disease. The connections go well beyond Lyme disease microbes. Two recent studies are shedding new light on how closely disruptions in the microbiome are linked to neuroinflammation. One, published in Frontiers of Aging Neuroscience, evaluated the presence of microbes in the autopsied brains of deceased Alzheimer’s patients. The other, published in Scientific Reports, evaluated the presence of microbes in the autopsied brains of people who had died of multiple sclerosis. Both studies used a new type of microbial testing called 16S ribosomal RNA gene sequencing, which enabled scientists to separate human cells from microbial ones, and positively identify microbes. They found that not only were microbes present in diseased brains in both studies, but the magnitude of their presence was astounding: The entire microbiome, with a full spectrum of microbes from the gut, mouth, and skin, were represented. Equally interesting, the control brains from people who had died of other causes also had a full spectrum of microbes present. The main difference? Diseased brains had a much higher concentration of microbes, and a greater prevalence of microbes with higher potential to cause inflammation. I believe these studies are landmark, because they illustrate the close ties between disruption of the microbiome and chronic neuroinflammatory illnesses. 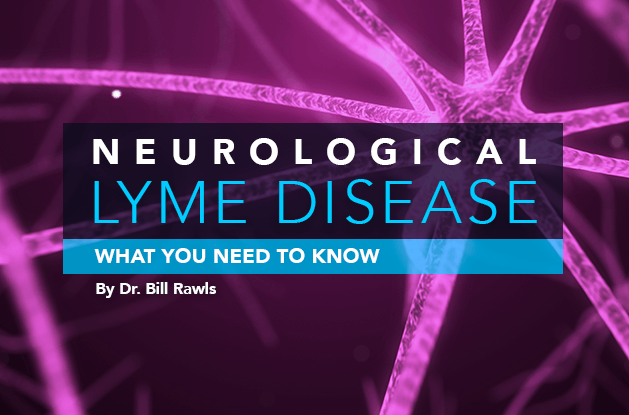 Considered in this light, they also highlight the potential connection between Lyme neuroborreliosis and other neuroinflammatory diseases. This would suggest that Chronic Immune Dysfunction is central to the equation, allowing opportunistic pathogens of many varieties (not just those from ticks) to flourish, cause system inflammation, and create a vicious cycle of unending misery. Ultimately, the type of illness a person might end up with depends on three key things: how the immune-disrupting factors come together; the types of pathogens they accumulated through life; and genetics (some people are more genetically at risk than others for these types of illnesses). Therefore, targeting individual microbes with antibiotic therapy alone is unlikely to restore normal health. So what does restore well-being? Therapy that comprehensively addresses chronic immune dysfunction and widespread disruption of the microbiome. When you’re suffering from debilitating symptoms of neurological Lyme, it’s tempting to seek out medications that promise fast relief. Unfortunately, the place for drug therapy in chronic neuroinflammatory illnesses is limited. In fact, because neuroinflammation is so complex, targeted synthetic drug therapy often disrupts the healing process. Many medications suppress or disrupt immune system functions and inhibit deep sleep, which is absolutely essential for recovery. Anti-inflammatory drugs, including steroids and nonsteroidal anti-inflammatory agents like ibuprofen and naproxen, disrupt immune functions and inhibit healing. These drugs have also been shown to inhibit clearance of beta amyloid, a proteinaceous substance associated with neuroinflammatory disorders that is the hallmark identifying factor of Alzheimer’s disease. Though short-term use of antibiotic therapy has shown limited benefit in some cases of dementia and MS, tolerance to therapy and relapse are inevitable with long term use of synthetic antibiotics. This makes sense when you consider that LNB and other neuroinflammatory conditions are primarily associated with disruptions in the balance of the entire microbiome and chronic immune dysfunction — as opposed to infections with specific pathogens. So while antibiotics initially suppress microbes in general, with extended use, pathogens arise in the gut and skin, gut and brain barriers are further compromised, and immune functions are further depressed, thus enhancing illness. 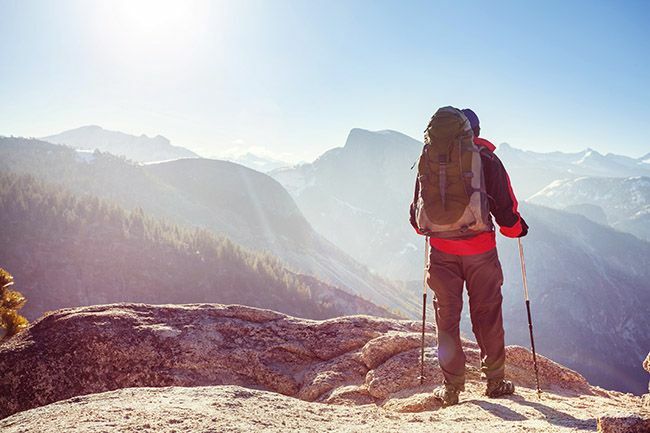 That might sound like a lot, but in fact, finding lasting relief from neurological Lyme calls for a more measured, lifestyle approach — one that’s supportive of your immune system so that you’re enabling your body to fight its own battles. Here, the five steps for putting this approach into motion. 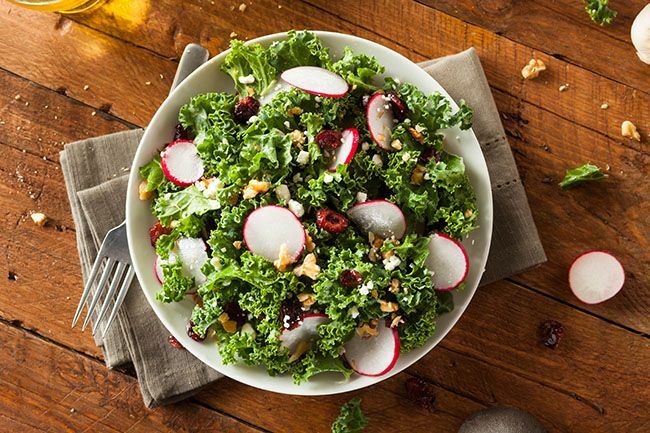 Vegetables provide essential nutrients and antioxidants for healing, and fiber for balancing the gut microbiome. Healthy fats reduce brain inflammation. These include the monounsaturated fatty acids in natural sources like olive oil and avocados, and omega-3 fatty acids from fish. Inflammatory foods, such as food products derived from corn and wheat, and corn-fed beef and pork, should be strictly avoided. Optimal sources of protein include fish, eggs, and poultry. Eggs in particular are rich in choline and other essential brain nutrients. If you’re seeking vegan protein sources, quinoa, peas, and hemp are good alternatives. Following a strict ketogenic diet has been shown to benefit recovery from neuroinflammatory conditions. That means keeping your carbohydrate intake low enough to cause brain cells and other tissues to switch from burning glucose to burning ketones. Admittedly, however, strict ketogenic diets are challenging to stick to consistently. Beyond eating fresh fish regularly, supplementing with omega-3 fatty acids has been widely studied for reducing inflammation in both acute and chronic neuroinflammatory illness. Krill oil and fish oil are optimal sources of the DHA and EPA omega-3 fatty acids necessary for brain health. To determine your optimal dosing levels, consider doing periodic blood testing for omega fatty acid balance; test kits can be bought online for approximately $100. Herbs are ideal for reducing systemic and neuroinflammation. They work by balancing your immune response instead of suppressing it, and directly inhibit tissue inflammation in the brain and nervous system. Anti-inflammatory herbs also promote optimal blood flow to the brain and tissues by enhancing vascular system function. Some of the best choices include turmeric, boswellia, resveratrol from Japanese knotweed, and French maritime pine bark. Cannabidiol (CBD), a cannabinoid found in the hemp variety of cannabis, has shown great promise for reducing neuroinflammation and calming nerve irritability, reducing pain, enhancing mood, and promoting normal sleep. Cannabinoids also balance immune functions. CBD from hemp is legal in all fifty states and can be shipped across state lines. It does not contain THC, the psychoactive substance in marijuana. CBD oil is the optimal form for delivery and absorption. Average dose is 10-50mg of full-spectrum CBD, one to three times a day. Finally, essential oils are excellent for reducing brain inflammation. They contain primarily fat soluble phytochemicals of herbs — ideal for penetrating brain and nerve tissue, which is 60% fat. Good essential oil choices for neuroinflammation include rosemary, oregano, frankincense, lavender, and lemon balm — the latter three also support normal sleep. Aromatherapy (olfactory delivery) is the most direct way to administer the phytochemicals of essential oils to the brain and nervous system. A toxic environment impedes recovery from any illness. And unfortunately, chronic systemic inflammation and neurological inflammation can compromise detoxification and waste removal processes in the brain and body even further. Toxic substances can enter the body by three routes — oral, respiration, and skin — so step one is minimizing the inflow. To reduce oral toxins, avoid processed food products, and eat a fresh, whole food diet weighted toward vegetables (the fiber in veggies enhances detoxification). 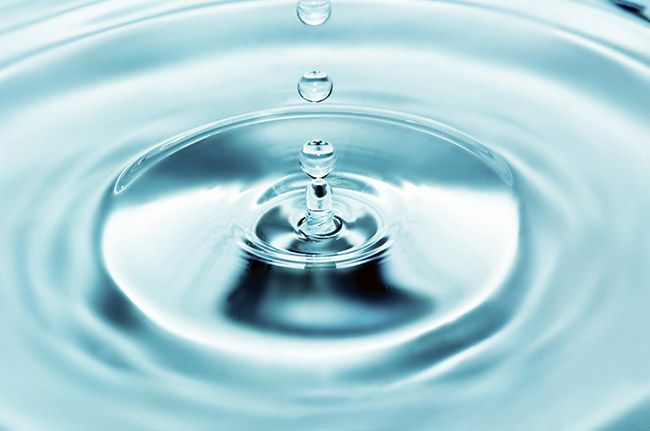 Clean water is also key, and is as simple as installing a water filter. Regularly changing your HVAC air filters and placing free-standing HEPA filters in rooms where you spend the majority of your time can go a long way toward improving indoor air quality. Breathing fresh air in natural places as often as possible can also promote healing. As for your skin, adopting a practice of using only natural skin care products allows you to avoid a surprising number of toxic substances commonly found in commercial skin care products. The same goes for household cleaning supplies. The Environmental Working Group is a great resource for finding toxin-free consumer products. Supplements that support detoxification in the body include activated B vitamins for enhanced methylation (a metabolic process that’s vital to cellular health), and glutathione, NAC, and alpha lipoic acid to support cellular functions and detoxification. Dandelion and milk thistle protect the liver and stimulate bile flow, which is essential for removing toxic substances from the body. Optimal levels of vitamin D are also important for recovery, as are zinc and magnesium. Magnesium is best taken as magnesium glycinate, which is calming and easy on the digestive tract. You might also consider hyperbaric oxygen therapy, a treatment that involves breathing 100% oxygen inside a body chamber with low and controlled atmospheric pressure. This therapy was found to be valuable in the Sears-Bailes protocol for overcoming traumatic brain injury, and has also been shown to be beneficial for Lyme disease recovery. Since stress is a powerful immune system disruptor, finding more calm is key to restoring immune health and resolving symptoms of neurological Lyme. One of the best tools to fight stress is getting optimal sleep. Without it, your immune functions are disrupted, and healing is compromised. Sleep is especially important for recovery from neuroinflammatory illnesses. Studies have shown that even one night of compromised sleep in healthy people is associated with accumulation of beta amyloid in the brain, a hallmark of Alzheimer’s disease. Your goal: At least 8 hours of good sleep a night, including 4 hours of deep sleep. 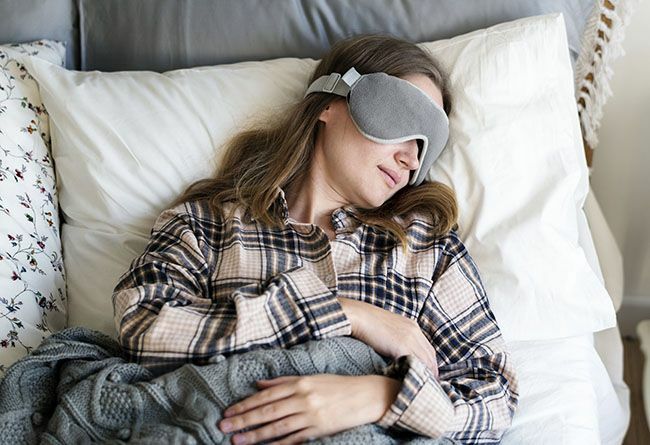 Practicing good sleep hygiene can help you hit the mark; that includes keeping a regular bedtime, and limiting light, computer screens, and stimulation in the evening. What happens during the day is also key to drifting off at night. Finding additional ways to de-stress, getting regular low-intensity exercise, and practicing meditation a couple of times during the day promotes good sleep onset and better quality sleep at night. Early on, when neuroinflammation is pronounced and the nervous system is very agitated, sleep medications may be indicated. But use them intermittently, and stick to the lowest dose possible. If you’re still battling stress and occasional sleeplessness, herbs can help. Some with calming, neuroprotective properties include ashwagandha, bacopa, gotu kola, kudzu, and milky oat seed. Nervine herbs also promote calm during the day and help improve sleep at night; these include passionflower, motherwort, lemon balm, and chamomile. Melatonin, an important antioxidant in the brain that initiates sleep, is reduced in neuroinflammation. Supplemental melatonin at bedtime (1-3 mg) can help rebalance disrupted sleep pathways. Tart cherry juice is an excellent natural source of melatonin, as is Chinese skullcap, an herb providing both antimicrobial properties and immune balancing properties. Acupuncture can be beneficial for reducing pain and restoring normal energy pathways in the body. It is also helpful for restoring normal sleep. Healthy blood flow is essential for recovery. Increased blood flow flushes out toxic substances that have accumulated from inflammation, and stimulates healing systems in the body. The best way to increase blood flow is by moving your body. Increased activity is associated with increased endorphins. Best known as the “feel good” substances that improve mood and wellbeing, endorphins also stimulate natural killer cells, the most important white blood cells for taking out cells infected with microbes. That being said, movement must be balanced so as to not generate more inflammation. 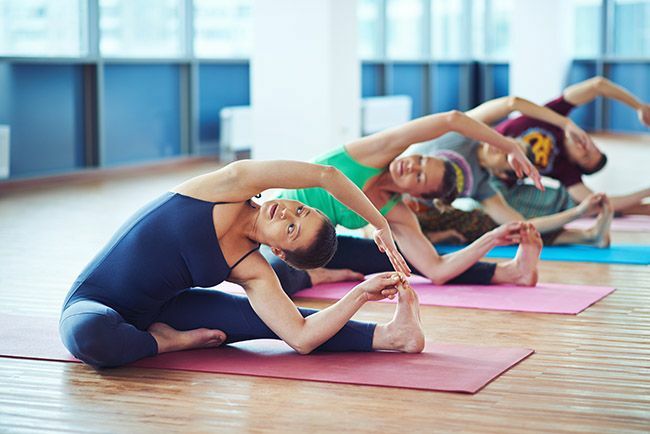 For this purpose, low intensity exercise such as walking, yoga, and tai chi is the best choice. If exercise is not practical, far infrared sauna is an ideal way to increase blood flow and promote removal of toxins from the body. 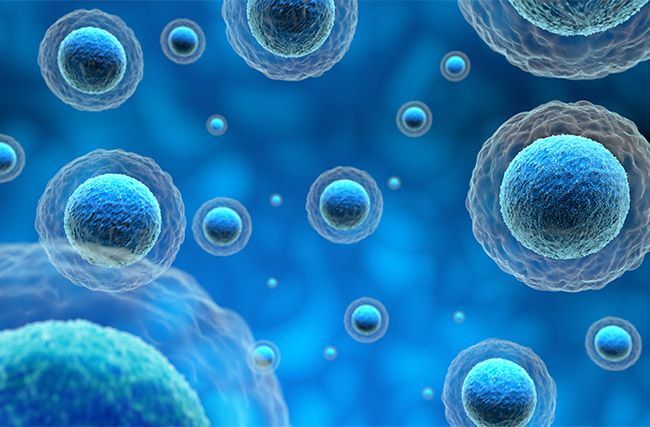 Restoring normal immune function and balancing the microbiome of the body is the most important part of overcoming neuroinflammatory conditions. It includes suppressing opportunistic microbes while also allowing normal flora to flourish so that immune systems can rebound. For this purpose, herbal therapy is a natural fit. Herbs with antimicrobial properties selectively suppress opportunistic and stealth microbes without disturbing normal flora. Herbs also help boost parts of the immune system that have been suppressed by the microbes. Many of the chemical components of herbs cross the blood-brain barrier and provide neuroprotective benefits. By restoring balance in the gut microbiome and the extended microbiome of the body, the gut-blood and blood-brain barriers are allowed to heal. There are many herbs with antimicrobial properties that can provide benefit for neuroinflammation associated with microbiome disruption. Some of the more common ones used in Lyme disease include andrographis, cat’s claw, Japanese knotweed, cryptolepis, and neem. Monolaurin is a fatty extract from coconut that provides antimicrobial properties, and because it is fat soluble, it easily crosses the blood-brain barrier and penetrates into brain tissues. Berberine and berberine-containing herbs, including coptis, goldenseal, and barberry, are ideal for balancing the gut microbiome and restoring a normal gut-blood barrier. 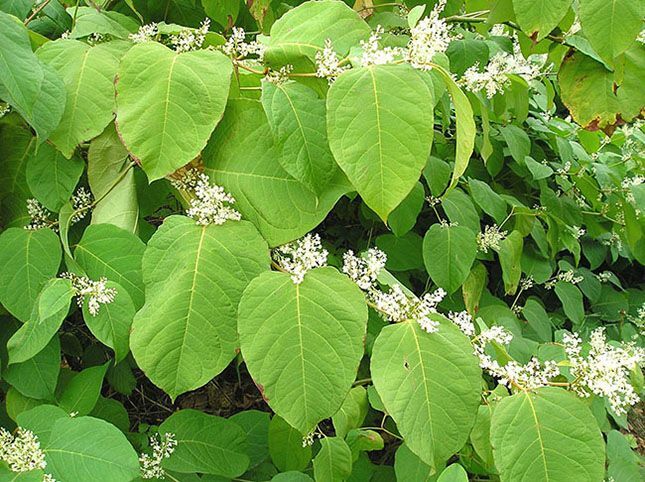 Sarsaparilla is another antimicrobial herb that is particularly good for balancing the gut microbiome. Herbs that boost the immune system’s ability to control stealth microbes and restore normal immune system functions, but at the same time reduce inflammation, are called immunomodulating herbs. Immunomodulating herbs that also provide neuroprotective benefits include cordyceps, reishi, rhodiola, and eleuthero. These herbs are also adaptogens, herbs that improve stamina and resistance to stress without having drug-like effects. Because the toxicity of most commonly used herbs is so low, herbs can be taken for extended periods of time without harmful effects. In fact, that’s exactly what it takes to wear down stealth microbes and other opportunists, and allow normal flora to flourish. The neurological system takes a long time to heal — it’s not a game that’s won in weeks or even months. Patience and persistence for the long haul is required to regain wellness. Many people have found, however, that persistence pays off: A comprehensive, natural approach to recovery is the most secure way to win. 2. Geeta Ramesh et. al. Inflammation in the Pathogenesis of Lyme Neuroborreliosis. Am J Pathol. 2015 May; 185(5): 1344–1360. 3. Forrester JD et. al. No Geographic Correlation between Lyme Disease and Death Due to 4 Neurodegenerative Disorders. Emerg Infect Dis. 2015 Nov;21(11):2036-9. 4. Clark K et. al. Lyme borreliosis in human patients in Florida and Georgia. Int J Med Sci. 2013 May 23;10(7):915-31. 5. Batinac T et. al. Lyme borreliosis and multiple sclerosis are associated with primary effusion lymphoma. Med Hypotheses. 2007 Jan 2;69(1):117-9. 6. Tsiodras S et. al.Central nervous system manifestations of Mycoplasma pneumoniae infections. J Infect. 2005 Dec;51(5):343-54. 7. Tsai CS et. al. The association between Mycoplasma pneumoniae infection and speech and language impairment: A nationwide population-based study in Taiwan. PLoS One. 2017 Jul 3;12(7). 8. Panagariya A et al. Reversible neurological syndromes with atypical pneumonia. Ann Indian Acad Neurol. 2011 Apr;14(2):127-9. 9. Kaufman DL et. al. Neurological and immunological dysfunction in two patients with Bartonella henselae bacteremia. Clin Case Rep. 2017 Apr;5(6):931-935. 10. Mayne PJ. Clinical determinants of Lyme borreliosis, babesiosis, bartonellosis, anaplasmosis, and ehrlichiosis in an Australian cohort. Int J Gen Med. 2014 Dec 23;8:15-26. 11. Breitschwerdt EB et. al. Bartonella vinsonii subsp. berkhoffii and Bartonella henselae bacteremia in a father and daughter with neurological disease. Parasit Vectors. 2010 Apr 8;3(1):29. 12. Usmani-Brown S et. al. Neurological manifestations of human babesiosis. Handb Clin Neurol. 2013;114:199-203. 13. Salva I et. al. Rickettsial meningitis. BMJ Case Rep. 2014 Mar 10. 14. Hongo I et. al. Ehrlichia infection of the central nervous system. Curr Treat Options Neurol. 2006 May;8(3):179-84. 15. Hassani A et. al. Epstein-Barr virus is present in the brain of most cases of multiple sclerosis and may engage more than just B cells. PLoS One. 2018 Feb 2;13(2). 16. Leibovitch E et. al. Viruses in chronic progressive neurologic disease. Mult Scler. 2018 Jan;24(1):48-52. 17. Emery DC et. al. 16S rRNA Next Generation Sequencing Analysis Shows Bacteria in Alzheimer’s Post-Mortem Brain. Front Aging Neurosci. 2017 Jun 20;9:195. 18. Branton W et. al. Brain microbiota disruption within inflammatory demyelinating lesions in multiple sclerosis. Sci Rep. 2016 Nov 28;6:37344. 19. Cadavid D et. al. Antibiotics for the neurological complications of Lyme disease. Cochrane Database Syst Rev. 2016 Dec 8. 20. Halperin JJ. Chronic Lyme disease: misconceptions and challenges for patient management. Infect Drug Resist. 2015 May 15;8:119-28. 21. Shokri-Kojori E et. al. β-Amyloid accumulation in the human brain after one night of sleep deprivation. PNAS. 2018 Apr 9. 22. Sugeno N et. al. A case with anti-galactocerebroside antibody-positive Mycoplasma pneumoniae meningoencephalitis presenting secondary hypersomnia. Neurol Sci. 2012 Dec;33(6):1473-6. 23. Neal W et. al. The role of primary infection of Schwann cells in the aetiology of infective inflammatory neuropathies. J Infect. 2016 Nov;73(5):402-418. 24. Colonna M et. el. Microglia Function in the Central Nervous System During Health and Neurodegeneration. Annu Rev Immunol. 2017 Apr 26;35:441-468. 25. Obermeier B et. al. The blood-brain barrier. Handb Clin Neurol. 2016;133:39-59. 26. Fung TC et. al. Interactions between the microbiota, immune and nervous systems in health and disease. 27. Layé S et. al. Anti-Inflammatory Effects of Omega-3 Fatty Acids in the Brain: Physiological Mechanisms and Relevance to Pharmacology. Pharmacol Rev. 2018 Jan;70(1):12-38. 28. Devassy JG et al. Omega-3 Polyunsaturated Fatty Acids and Oxylipins in Neuroinflammation and Management of Alzheimer Disease. Adv Nutr. 2016 Sep 15;7(5):905-16. 29. McDougle DR et. al. Anti-inflammatory ω-3 endocannabinoid epoxides. Proc Natl Acad Sci. 2017 Jul 25;114(30):E6034-E6043. doi: 10.1073/pnas.1610325114. Epub 2017 Jul 7. 30. Rudroff T et. al. Cannabidiol to Improve Mobility in People with Multiple Sclerosis. Front Neurol. 2018 Mar 22;9:183. 31. Petrosino S et. al. Anti-inflammatory properties of cannabidiol, a non-psychotropic cannabinoid, in experimental allergic contact dermatitis. J Pharmacol Exp Ther. 2018 Apr 9. 32. Mori MA et. al. Cannabidiol reduces neuroinflammation and promotes neuroplasticity and functional recovery after brain ischemia. Prog Neuropsychopharmacol Biol Psychiatry. 2017 Apr 3;75:94-105. 33. Richer A. Functional Medicine Approach to Traumatic Brain Injury. Med Acupunct. 2017 Aug 1; 29(4): 206–214.